As most content types will end up with a special route, a very simple solution is to simply add a special Page type for restricted pages and handle the authorization in the controller action. The downside of this technique is of course that you need a lot of different page types and making a non-restricted page restricted basically means recreating it with a different page type. 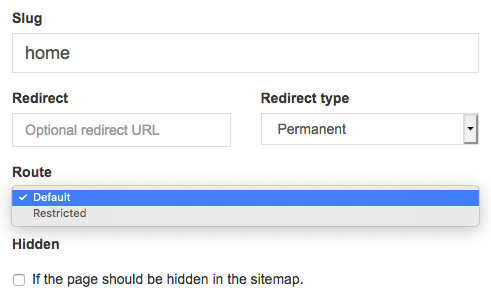 A neater solution is to provide multiple routes for your page types that handle if the page should be restricted or not. This can be achieved by adding more than one PageTypeRouteAttribute to your content type. By providing multiple routes to a page a dropdown will appear in the pages settings where the editor can choose which route should be used. In the controller action the same technique applies as when using multiple content types. As you can see you can apply authorization to your pages using the built in features of Piranha, and since there's no connection to any special kind of authorization it's very simple to integrate it to whatever method of authentication and authorization you're currently using. Have you secured your pages in a different way, let us know in the comments so everyone else can see other ways to implement the same functionality.